The night before the big hunt in the village, nobody sleeps—everyone is too excited. Early in the morning, Tata Ndu assembles his hunters. There are hunters with torches, bows, spears, and sticks. Some of the villagers have come to clear the grass with heavy sticks, thereby drawing the animals out into the open. The hunt is a ritual for the entire community: everybody’s involved, whether as a hunter or only a helper. The hunters venture out into the forest. Adah joins some of the elderly women, who carry ceremonial torches. Orleanna and Ruth May also walk along, surveying the hunters’ progress. Men light most of the forest on fire, leading to cries of pain from the animals in the trees. It makes sense that Adah would see the hunt as a big, complicated process, in which everyone plays a part. She’s already analyzed the Congo itself in exactly these terms, and in general, her scientific turn of mind helps her see the connections between seemingly unrelated things. Adah thinks back on this day in her life with amusement and admiration—this was the day when she realized a simple truth: humans are animals, too, competing for food and water. In the end, the survival of one animal is always commensurate with the death of a different animal—this is the one unbreakable law of the living world. Adah draws a broader conclusion from her time in the hunt: there’s no such thing as a moment for celebration, at least as it’s usually understood. One being’s happiness always rests on another being’s unhappiness: the hunters celebrate their victory at the cost of animals’ lives. One could say nearly the same of the Belgian colonists: their prosperity rested upon the misery of the Congolese. Arn, Jackson. "The Poisonwood Bible Book 4, Chapter 52." LitCharts. LitCharts LLC, 29 Jun 2016. Web. 22 Apr 2019. Arn, Jackson. "The Poisonwood Bible Book 4, Chapter 52." LitCharts LLC, June 29, 2016. 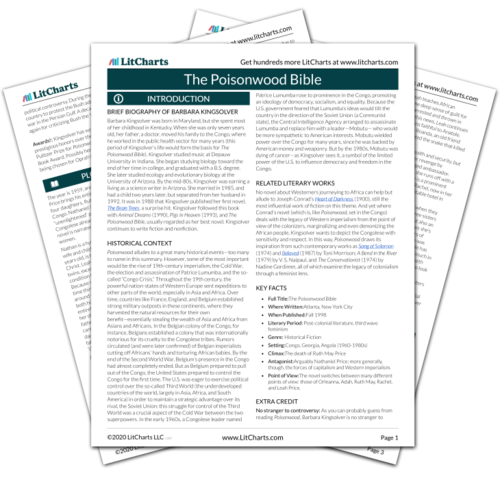 Retrieved April 22, 2019. https://www.litcharts.com/lit/the-poisonwood-bible/book-4-chapter-52.